This attractive mammal has a chestnut upper body, with buff to cream underside, noticeable ear tufts and the famous fluffy tail. It is a smaller animal than the introduced grey squirrel. 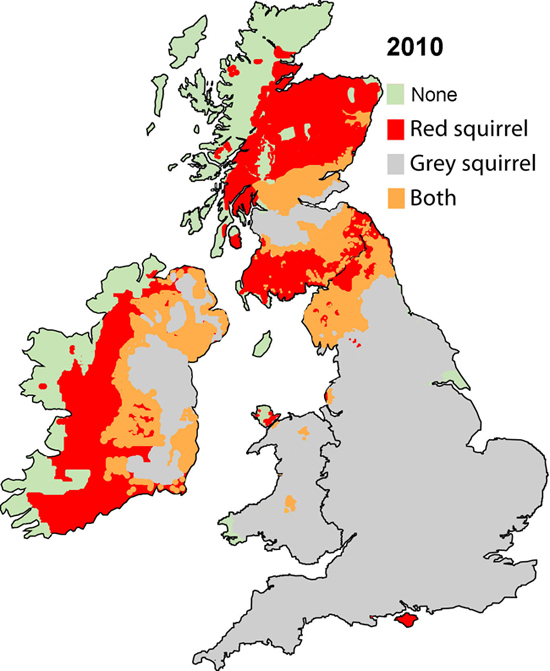 Red squirrels are naturally found across most of Europe into northern Asia and Siberia. In this part of its range the creature is not threatened. 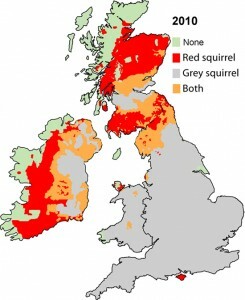 In the UK it is restricted to a few sites, mainly those free from competition by grey squirrels. The red squirrel was historically widespread on Anglesey and particularly within the broadleaved woodlands bordering the Menai Strait. The species also benefited from the maturation of coniferous plantations established on Mynydd Llwydiarth (Pentraeth) and Newborough Warren by the Forestry Commission during the 1950s. However, from the early 1970s, grey squirrels were increasingly observed on the island having either swum the Menai Strait, or crossed using one of the two bridges. Accounts suggest that the red squirrel population declined sharply in the late 1980s as grey numbers increased, and during the early 1990s sightings were relatively scarce. In 1997 the red squirrel population on Anglesey was close to extinction and fewer than 40 adults remained. Fourteen years later and the population has increased to over 400; with red squirrels now a common sight in coniferous woodland, broadleaved stands, parks and gardens. In 2008 they crossed the Menai Strait and colonised several Gwynedd woodlands. The single biggest factor in the fortunes of the native red squirrel is the presence of the non-native north American eastern grey squirrel. This larger species competes for resources with the native red squirrel and carries a disease to which the grey is immune but which is deadly to the red squirrel. As an island Anglesey offers a unique opportunity to exclude grey squirrels and today there are only a handful of grey squirrels remaining. 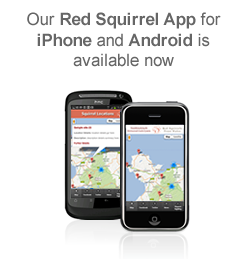 The Trust is working to eradicate the remaining grey squirrels and to improve the habitat for the native red squirrel. Red squirrels do not hibernate but they do lay down stores of food to see them through periods when fresh food is not available. Where they are found in mixed broad-leaf and coniferous woodland they have a source of food all year round, as pine seeds are present over the winter months. 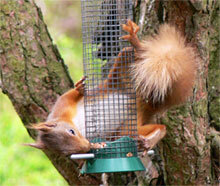 However, red squirrels have quite a varied diet which includes seeds, buds, flowers, leaves and fruit. They are known to take insects, fungi and birds’ eggs. Fungi is collected and dried by wedging it in the trees branches. 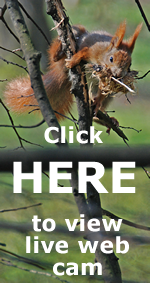 Red squirrels build nests, called dreys, from sticks and moss and placed high in the branches. They produce two litters of three to four kittens a year, usually in March and July. The drey is often the first evidence of the presence of red squirrels in a wood. Other signs are chewed pine cone ‘cores’ (birds leave ragged remains), split hazel nut shells (dormice make a hole to extract the kernel), cut tree shoots and scattered droppings. Red squirrels can live for up to six years. They are chiefly active during the day and most of this time is spent foraging. In the last 50 years, the dramatic decline in numbers has been due to loss and fragmentation of habitat, disease and in particular, competition from the introduced grey squirrel (Sciurus carolinensis). Red squirrel: Classified as Lower Risk – near threatened by the IUCN Red List, and listed under Appendix III of the Berne Convention. Threatened in the UK, and protected under Schedules 5 and 6 of the Wildlife and Countryside Act (as amended). Grey squirrel: Classified as a destructive pest in the UK under the Wildlife & Countryside Act (as amended) where it is listed under Schedule 9. Distributions: In Wales, red squirrels are only now found in broadleaved woodland on Anglesey and sites next to the Menai Strait. Elsewhere in Wales populations are isolated in conifer plantations. Click on the map to enlarge it. The native Eurasian red squirrel (Sciurus vulgaris) is a lot smaller than the grey squirrel and is not seen as often foraging on the woodland floor. Coat colour: Can be quite variable; some individuals appear dark brown, others a copper red. In many areas, the tail can fade or ‘bleach’ to a straw yellow colour during the summer months. Ear tufts are present during the autumn and winter months. The North American eastern grey squirrel (Sciurus carolinensis) was first introduced to the UK in 1876. Coat colour: The coat is a grey colour but with areas of red particularly on the head and down the flanks. The tail has a conspicous white edge. In 1998 there were only 30-40 red squirrels remaining in Pentraeth forest on Anglesey. Although the population expanded following localised grey control, the fragmented nature of the islands woodlands meant that a series of reintroductions were undertaken to speed up the spread of red squirrels. This process also enabled the genetic diversity of the island gene pool to be improved. The first reintroduction took place in Newborough forest during 2004-2007. Animals were housed in large forest enclosures from which they, and any young produced, could be released. Although the reintroduction was a success, future projects housed squirrels only for three weeks before release and used small numbers of animals (6-8) per reintroduction to minimise adenovirus infection risks. Squirrels typically build dreys high in the woodland canopy. They will also use tree holes and sometimes nest boxes. Nest boxes were first successfully used to monitor wild red squirrels in the UK at a site in west Lancashire (1994-1997). This study revealed that the animals would readily breed within the boxes. It was also discovered that rates of box use declined through the winter and spring months. The peak in use was in the autumn, the season of the year when red squirrel populations are typically at there highest density. On the island of Anglesey , 60 nest boxes were been used to monitor the wild red squirrel population in Mynydd Llwydiarth (Pentraeth forest) in the period 2001 to 2008. The boxes were an invaluable monitoring tool and yielded vital data on red squirrel litter sizes and parturition dates. In the Newborough reintroduction project, released red squirrels regularly used between 73-87% of the 30 nest boxes in the forest. We always ensure that boxes are full of hay when first erected, as the squirrels like to nest within this material. They either make a cavity in the hay or sleep on top in a hollow. The animals will bring additional material into the boxes themselves. This includes items such as dry moss, soft strips of bark, grass, and sometime pieces of foliage and twigs.